Recently reorganized under the Commission system favored by Charlie "Lucky" Luciano, in 1932 the American Mafia reacted quickly to a bloody revival of old underworld rivalries. 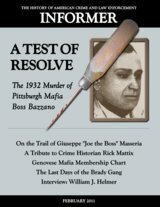 Luciano's underboss Vito Genovese called together an underworld convention in Brooklyn and ordered Pittsburgh Mafia boss John Bazzano to appear and answer for the recent murders of the Neapolitan Volpe Brothers. Preview or purchase Print edition of this issue. Preview or purchase Electronic edition of this issue. Printed, bound copies of Informer can be purchased individually or in bulk quantities through the MagCloud/Blurb service using the link below. Copies can be delivered worldwide. Prices vary from issue to issue. Issues can be previewed before purchase.